If it wasn’t for a toe wart, I may not have figured out what to do with my first murder mystery. For months now, I’ve had a strange growth on a toe on my left foot. I was pretty sure it was a wart, but never went to the doctor about it. After all, it didn’t hurt badly when I put pressure on it. Oh, it stung a very tiny bit, but it was manageable. Better yet, it wasn’t spreading, so what was the problem? Well, okay, it sort of got in the way of practicing yoga but that’s about it. Well, I’d finally had enough and decided to visit the local clinic tonight to finally have it looked at. It wasn’t a major pain, but it was annoying enough. You know what else is annoying, though? Writer’s block. See, ever since I finished The City of Smoke & Mirrors, I’ve wanted to write a sequel. I have ideas for over a dozen or more adventures starring Dilbert Pinkerton. Some are just titles, others are rough plot ideas, others are somewhat fleshed out in my head space. Last year, I started working on a sequel. Unfortunately, after about 30,000 words, I hit a block: I didn’t really know how to write the main antagonist or villain. I tried writing his introductory scene three times and none of them felt either natural or fun enough to write the rest of the book using that personality. 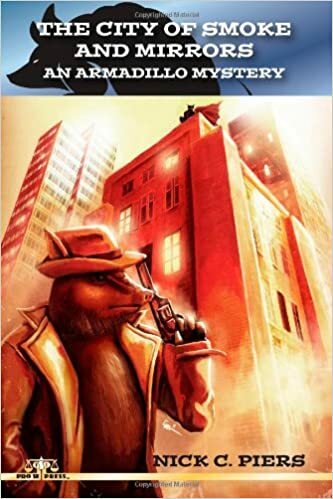 Rather than forcing myself to keep going, I decided to put it on the back burner and work on a different, separate Armadillo Mystery. Maybe if I gave myself some space from Mr. 30k, something would come out. So I put all my brain power into a new mystery; a murder mystery. Late last year, I had this great idea for a hook regarding where a body is discovered. I started brainstorming a mystery around this dead body and got pretty far. I combined the murder idea with a rough idea for one of the dozen Dill-adventure ideas. All things were going well. But then I ran into trouble with motives. Why did someone commit this murder in just such a way? Why target this particular person? For the past few weeks, I’ve racked my brain trying to figure out what to do with this murder mystery. By this point, I’d already written about 10,000 words..
Because it bothered me so much, I brought four things with me to the clinic: my phone, a copy of Now Write! Mysteries, a pen, and a notepad. The phone usually came with me everywhere and sure enough, I spent most of my time on that, eating away at my monthly data plan and the phone’s battery life. Every so often, I’d put it away and flip through Now Write! to skim its chapters. It’s a book dedicated to give advice on writing mysteries. I kept looking through it like some Christians refer to the Bible when they want a question answered. I came up empty in this particular scripture. On my phone, I chatted with some friends on Facebook. Just to have something to do or read, I posted a question to fellow writers: what do you do when you’re stuck on the how’s, why’s, what’s, or who’s of a story idea. I even tweeted the question to comic book writer Gail Simone, who responded quite positively. My phone’s battery eventually died, though. I didn’t want to keep flipping through Now Write, so I pulled out my pen and notepad. Frustrated with myself, I started writing down question after question: what does the murderer want? Who benefits? Why strike now? What will they do if their demands aren’t met? What will they do if their demands are met? Where does Dill play into this? What’s their motivation? What’s the secret? Other questions related to the motivations popped up. Suddenly, I was answering some of those questions. This is why it’s happening now and this is who’s doing it and how. But if this is the person doing it, where are they in all this? Oh, and then, if their demands aren’t met, then this happens! Ooh, that’s not bad, because then this could be a red herring. But then if that happens, how does Dill or the target react? After about an hour of just free-writing questions and answers, I had a pretty decent mystery to write. Of course, all this might be for naught when I start writing and it turns out the ideas are still not really very exciting or interesting in practice, but that’s just another one of those joys of writing, isn’t it? So, in conclusion? What saved this murder mystery? A dead phone battery and a toe wart. I mean, sure, there’s a valuable lesson in there somewhere about shutting out the world for a short while to free-write, ask a lot of questions, and just persevere through the problem. But I’m totally dedicating the book to this wart. The next time someone tells me what to do when they get writer’s block, I’ll tell them to get a toe wart. This entry was posted in Essays, Joys of Writing, Writing and tagged joys of writing. Bookmark the permalink.